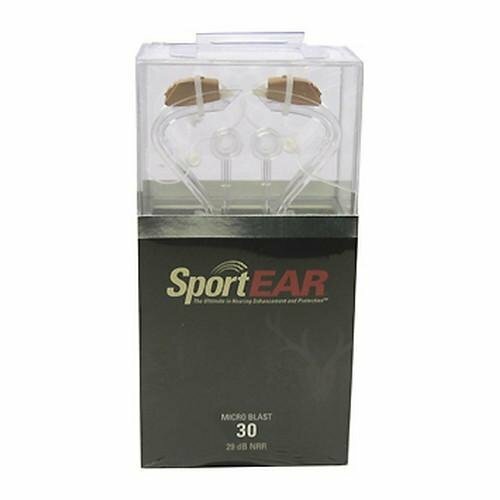 Sportear Micro blast (pair) is the most discrete, hi-tech behind the ear device available. Provides maximum advantage in the field. Features:- 100% digital signal processing (dsp)- 7x normal hearing amplification- auto blocker compression protects you from damaging sounds- 2 channels provide high fidelity sound equalization- background noise reduction technology- comfort fit tip forms comfortably to your included:- sportear carrying case- 10A zinc air batteries- cleaning kit- pair of acoustic tips- pair of flare tips- pair of foam tips- Instruction manual""